The latest Progressive challenge at the Outlawz features a beautiful digi by Sheepskidesigns drawn by the very talented Andrea Norris. Andrea has drawn this digi in two versions depending on which side of the pond you are on. For me it has to be Mum so this is what I made with it. I used some fabulous card from Hunkydory for my base and layered up the digi on some cerise card, both cut with a hexagon die, the image has been coloured with Copics and I used a couple of butterflies to bring it all together. So if you are not already playing with us why not come over to the Outlawz and sign up for the challenge - details are on the challenge post of how to get your digi and if you post a project using the digi by month end you will automatically get the next one and we have some beauties lined up for you! 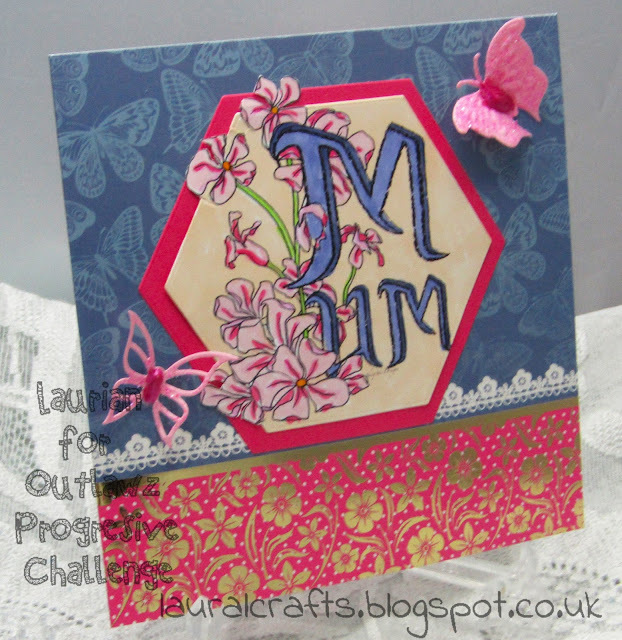 Darcy has been so busy getting wonderful images for the challenge you will love them!